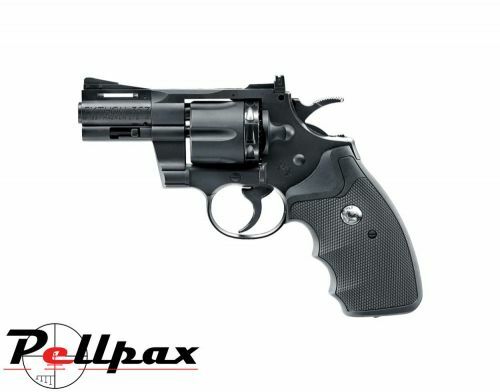 The Colt Python 2.5" Revolver 4.5 mm is a realistic replica of the .357 Magnum revolver, powered by one 12g CO2 cartridge. The rotary magazine is a 10 shot BB or Pellet, putting it ahead of others on the market. On the revolver you will find licensed marks, reminiscent of the original manufacturers markings. It is constructed in the majority ​​of durable plastic, and the individual components such as the hammer, valve, trigger, and inner barrel are made ​​of metal. The Python is equipped with a manual safety and adjustable rear sight so you can hit your target every time. Add this item to your basket & spend an extra £410.01 to apply for finance. Gerber Paraframe II Folding Serrated Edge Knife 3.5"